psst/ if you've popped over for the first time (hello!) or have missed a few posts, you might be interested to hear that I'm running a #hatvent throughout December on Instagram, Twitter and Facebook whereby I offer a discount on different (surprise) Hat pattern each day. I'm also posting the Hat of the day in my Ravelry group, too. Follow along to catch the latest deals and news! 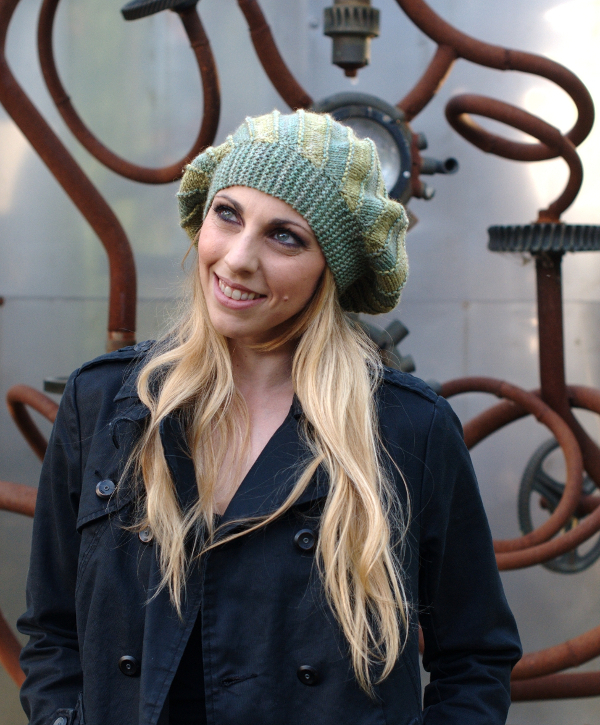 Bimitral is a sideways knit Hat worked on the bias, in two colours. Short rows are worked at the brim end and crown end to create the shape, and the construction makes it incredibly adaptable. Want something more slouchy beanie, less beret? Leave out the short rows at the brim end. Want to work in a different weight yarn? Simply check your stitch gauge for depth, cast on the appropriate amount, and keep knitting until it fits around your head. The softly gathered crown leaves lots of room for adjustments - as long as it fits at the brim and doesn't drown in depth, you're good to go! 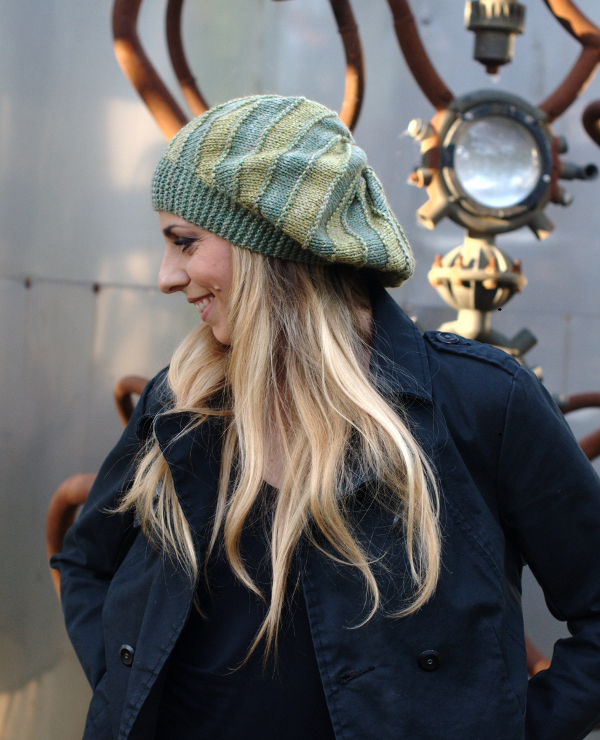 The Hat is designed for Anzula Cole, which is a wonderful blend of camel and silk. Soft as it is, it isn't the stretchiest of yarns naturally, so the garter stitch sideways helps out there - when turned through 90 degrees garter stitch makes the perfect ribbing. You could also add a slipped stitch edge to the garter stitch, too. I tend not to, as I haven't yet worked out the best way of mimicking that slipped stitch on the selvedge when grafting, but that's me. I tend to get bogged down in the little things. The pattern calls for garter stitch grafting to finish the Hat. That may sound odd, considering it's all panels of stocking stitch, but you see those purled ridges that separate the colour panels? When you graft, you'll be replicating those. And whilst a reverse stocking stitch graft might be the obvious choice, it doesn't work. A reverse stocking stitch graft adds two ridges, whereas the garter adds only one. Without getting too technical when you graft, you're sort of creating two rows. Or rather you're not, you're creating a top half and a bottom half of a row - two half rows. You are only grafting one true row (it's physically impossible to do anything else) but it has a relationship with the rows either side of it, and it's that that's important. A purled graft creates two sets of ridges with it's neighbouring rows, creating the effect of two purled ridges. A garter graft creates a ridge at the top (or bottom, depending on which method) and a V (or valley) the other side. Still with me? A garter stitch graft is really the easiest of the lot, really - what you do on the front needle you do on the back. There's no mirroring to do or four sets of manoeuvres to remember; just repeating the same two motions over and over. Bimitral is a fun knit, and if you're a fellow lover of less than common construction and other than normal directional knitting, you might rather enjoy it! ps/ have you figured out the name?